COMBINE the biscuit crumbs, coconut and butter. Press into the base of a greased 20cm springform pan. Chill. BEAT the PHILLY and sugar with an electric mixer until smooth. Stir in the gelatine and chocolate until smooth then mix through the raspberries and rosewater. Fold through the whipped cream. Stir through one third of the egg whites then gently fold through the remaining whites. POUR the mixture over the prepared base. Chill for 3 hours or until set. 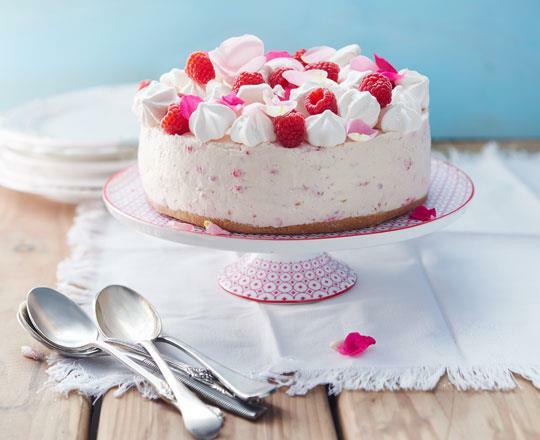 Decorate with extra berries, meringues and rose petals. Serve immediately. When adding the raspberries ensure they are broken up and dispersed through the mixture, they should not be whole.